. Or . 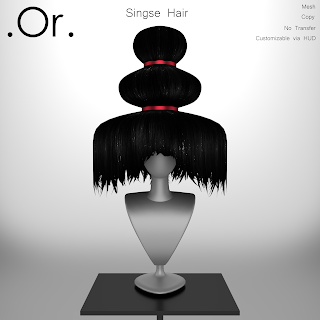 Singse Hair | . Or .
. Full Perm Creations . Singse Hair is an original creation by . Or . It has a gradiant, a blonde, a brown and a redhead pack option. Each pack comes with a colour change HUD with seven different hair colours and a re-size option.
. Or . Lioth Bag New design from . Or . , Lioth bag, available in 4 colors here . Comes with 2 options : hand bag and shoulder bag.
. Or . Ceros Ceros is an original design by . Or . It comes in white, black and red. Available here .
. Or . Voldi Voldi is an original design by . Or . It comes in 5 different tones. Available here .